I’m still alive – Here’s what I’ve been doing. O.k., so I know that the last few months have been pretty sketchy as far as my blog posting. You wouldn’t believe the back up of fun things that I have to post about though. Here are a few of the activities that I have piling up in my photo files. I can almost bet that I won’t get to all of them, but if you see something that sounds particularly interesting, let me know and I’ll work on those ASAP. Besides the busy schedule, I also have been having some technical problems with my laptop AND just hit the wall with the message that my external drive (where I store all my photos) is full. Looks like I’ll be shopping for a new external drive. Hopefully we won’t need to get a new laptop, but I’m a little concerned that it might breakdown on our trip in August. Hopefully it will be resolved one way or the other before then. Here’s a little sneak peak for one of the events. 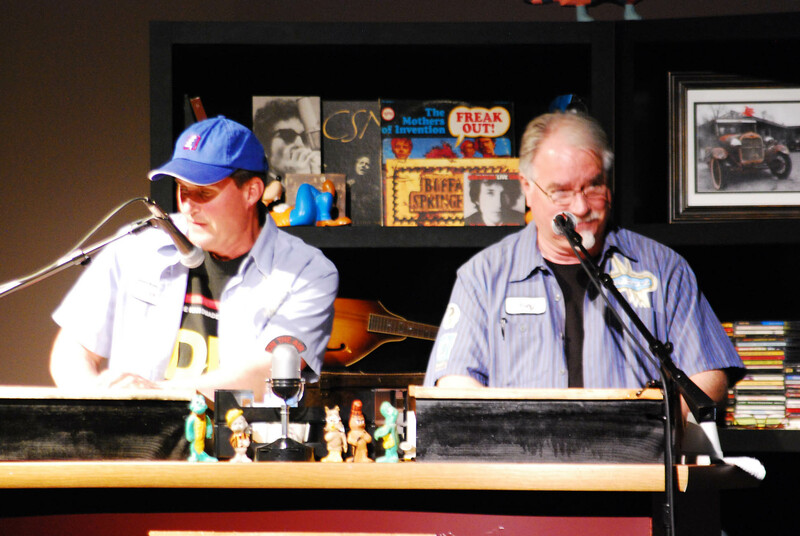 This is Steve Larson and Bob Ryan performing in The Dubious Brothers Radio (Stage) Show for the Open Door to the World Annual Fundraiser last weekend. Sorry, I don’t have the exact name of it. Click to enlarge. Lots more photos on that to come. Here’s the list of my latest activities that are waiting to post…any preferences? Dinner at the Mozingo’s with the reunion team – can you say AMAZING! Will you please write/blog more about how you and dad met/started dating/etc? Well, I for one can’t wait for ALL those posts!! But for starters, I’d love to see Diane’s branch… the Squaw Peak Inn… and your Reunion Team Dinner Party! And then all the rest! Quite frankly, I think you need to quit your job and blog more!! Oh Linda, don’t I wish I could quit my job to take pictures, blog, do crafts, sewing, decorating, traveling, volunteering, etc., etc. etc. It’s Sharon’s branch. She found it in Sedona too.